UPDATE: Added new WHERE statement to select just iOS devices (see below). Today’s workplace no longer follows a strict standard in terms of endpoint devices. Despite the efforts of your infrastructure, network, and security teams users are connecting non-approved devices to your network and your Citrix farm. A lot has been said about the “Consumerization of IT” and it is a reality for any Citrix administrator/engineer. In this blog post we will explore how to find these types of devices using EdgeSight. The following query will select mobile devices that connected to your farm in the last 30 days. The new Citrix Receiver sets the client name to ‘mobile’. On a PC this is typically the environment variable %COMPUTERNAME%. To find the devices that are connecting, you can use the horizontal (client_disp_horiz) and vertical (client_disp_vert) resolutions and compare them to current resolutions of mobile devices. I found a nice reference list here. This can get you half-way there. 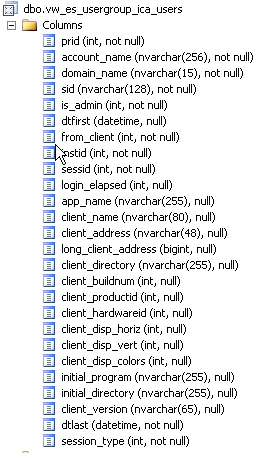 The only other way that I’ve been able to distinguish the client that is connecting are the ‘client_buildnum’ and ‘client_productid’ fields. Unfortunately, finding an updated list of ICA/Receiver build numbers is not easy. Stephane Thirion at Archy.net provides a recently updated list. We can also use VW_ES_USERGROUP_ICA_USERS to report on thin client devices. It is unlikely that thin clients will be an unapproved device on your network, but we can get some useful data on them from this view. The following query will select thin client devices that connected to your farm in the last 30 days. If the thin client is windows-based, chances are the client_version field will give you the currently installed ICA client on the device. You can use this information to pester the person in charge of thin client’s to update them or replace them (just kidding – but really you need to get them updated). For this example, we examined the ‘client_directory’ column and determined that if it started with a ‘\’, it was a thin client. You may have to experiment with this field depending on which thin clients you have in your environment. I hope this post has shown you how to track down non-pc devices connecting to your Citrix farm. Once you have determined the ICA/Java client versions connecting to your farm (see the ICA Client Version report in EdgeSight!) you can modify these queries to find Java client users and Macintosh users. As always I welcome all comments and questions. I’m not sure if you are still monitoring this post, but I ran into a similar request for mobile/tablet report the other day. I ran the SQL query as you provided, but I only see columns with no data. I also tried WHERE client_name like ‘iOS%’, but received the same no data results. Running the canned Top 1000 on the view produced data. Can you offer some guidance? I’ve been busy with my previous job and really neglected this blog. I will try and do better in the future. In terms of your question, I will have to explore that myself. I know newer versions of the Citrix Receiver do not report the device type the same way, but I have not had a chance to dive into what EdgeSight is recording from these new Receiver versions.